Transcell Technology TI-500SL is a rugged, industrial, NTEP & Canadian Certified digital indicator housed in a NEMA 4X stainless steel enclosure. It comes with a large 0.8” backlit LCD screen for easy readout of up to 50,000 display divisions, and supplies enough current for up to 4-350Ω load cells. 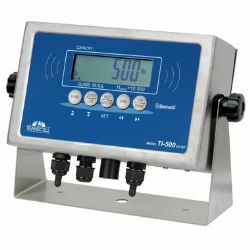 The TI-500SL is an industrial NTEP & Canadian Certified digital weight indicator. Enclosure is a NEMA 4X stainless steel. The weight readout comes with a large 0.8 inch backlit LCD screen for easy readout of up to 50,000 display divisions, and supplies enough current for up to 4-350Ω load cells. Recommended replacement for Salter Brecknell 200SL. All setup parameters may be entered via the front panel keys. The TI-500SL uses full duplex RS-232 serial format for communication with many types of attached support equipment. The TI-500SL is configured with a rechargeable lead acid battery. An AC adapter is included for continuous power operation and to recharge the lead acid battery. An AC adaptor is included with this indicator. The TI-500-SL features a hold function with multiple choices. Below is a summary of those choices. This mode captures the weight of an unstable load, e.g. livestock, by freezing the weight on the display. Use the Motion Band setting (F5) and the Percentage Hold setting (F12) to adjust this mode to your specific application. When the weight has been locked onto the display, two arrows beneath the weight display will be turned ON. AUTOMATIC (A11 = 1) – Automatically locks weight on the display when stable. If the weight of the object on the scale changes by the F12 setting (e.g. 10%) then the sale unlocks the held reading and relocks onto the new weight. This occurs during both increasing and decreasing weight values. MANUAL (A11 = 2) – Press the NET/GROSS key before applying any weight to the scale. After the load has stabilized, the display will hold the weight reading on the screen until the NET/GROSS key is pressed again. If the weight of the object on the scale changes by the F12 setting (e.g. 10%) then the sale unlocks the held reading and relocks onto the new weight. This occurs during increasing weight values only. PEAK HOLD (A11 = 3) – The display updates as the load increases but not as the load decreases. The value shown on the screen is the maximum weight applied to the scale. Press the UNITS key to toggle between live mode and peak hold mode. The ‘P’ annunciator is used to indicate that you are in Peak Hold mode. When you exit out of peak hold mode, the old peak value is automatically cleared. SEMI-AUTOMATIC (A11 = 4) – Same as Automatic mode except that you can use the NET/GROSS key to cancel; press the NET/GROSS key again to re-arm.